Today is World Animal Day. 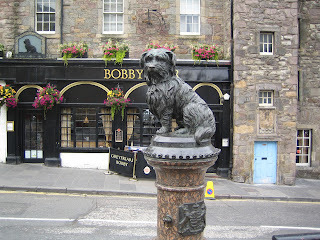 This is the story of Greyfriar's Bobby. John Gray (Auld Jock) was employed as a Night Watchman in Edinburgh in the mid 1800s. Together with his dog, a little Skye Terrier called Bobby, they patrolled the Old Town and both were a regular sight winter and summer. The most conspicuous mourner at Auld Jock's funeral was the little terrier, Bobby and the next morning the Curator of the burial ground found Bobby lying on the newly made mound of earth. 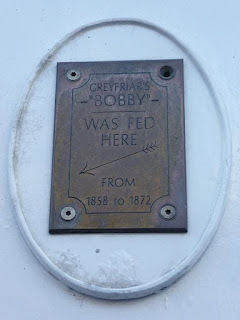 Bobby was driven out as dogs were not permitted in the graveyard but the next morning, there he was again, and the next day, and the next day until the Curator took pity on him and gave him some food. Often, in very bad weather, he was encouraged indoors but Bobby was having none of that and he kept his vigil in the graveyard. 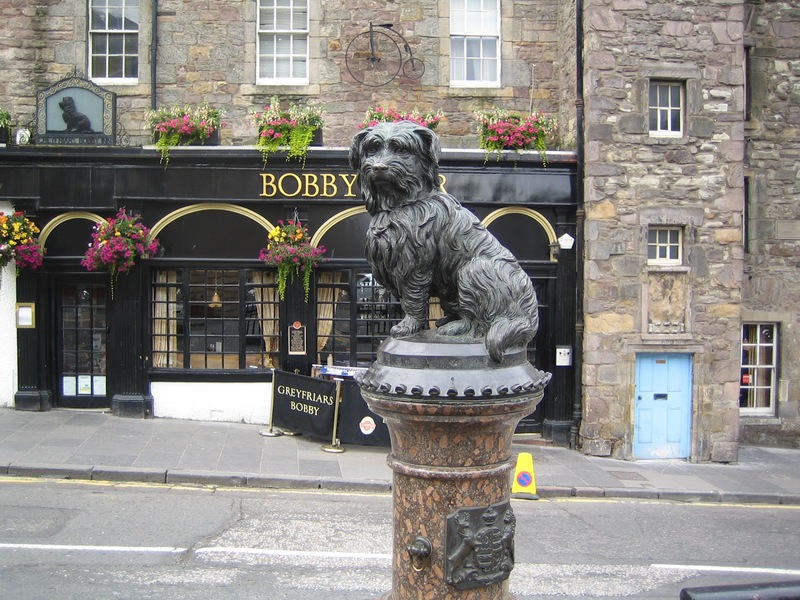 Bobby's fame travelled throughout Edinburgh until one very hot Summer an epidemic of distemper broke out and all dogs not muzzled or licensed were ordered to be put down. 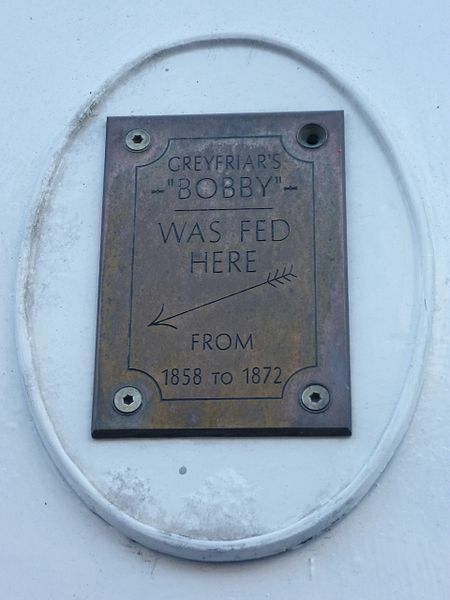 On one particular day Bobby was at the Eating House having his dinner with a certain Mr Traill. He had been encouraged to appear on the stroke of the One O'Clock Gun that that was his call to dinner. A policeman called asking after Bobby's license. 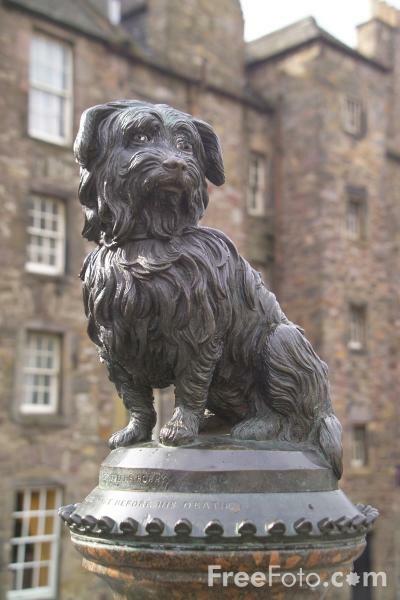 On being told that Bobby's master lay in Greyfriar's Kirkyard, Mr Traill was summoned to the Court to answer the charge of keeping a dog without a licence. After much debating the case was dismissed. As Bobby had no owner, it was likely that he would have to be destroyed. 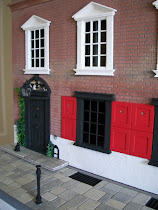 The Lord Provost got to hear of this tale and summonded the dog and Mr Traill to his house. 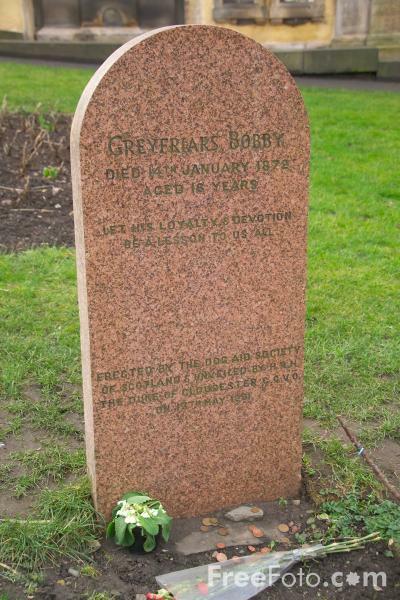 He was so taken with little Bobby that he decreed that as he lived in the church yard, then they be the owners and he paid for Bobby's licence fee and gave him The Freedom of the City of Edinburgh. For 14 years, until his death in January 1872 (aged 16), the people of Edinburgh took care of little Bobby but he remained loyal to his master and kept constant watch over the grave of Auld Jock. 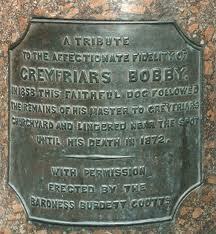 He was buried just inside the gate of Greyfriars Kirkyard. His loyal devotion to his master inspired a lifesive bronze sculpture and water fountain. The lower level for dogs and the upper level at human height. 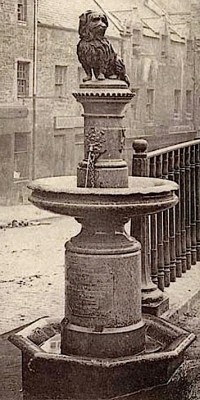 The water supply was discontinued in 1957 due to public health concerns. What a lovely story! I like when you tell parts of your tradition. In my country there is a dog that appears at every funeral, everyone, and accompanied the coffin from the church to the cemetery. Maybe in another life he was a priest, who knows? I saw a film about this dog only a few months ago. Such a sweet story! What abeautiful post. I feel like a great big sap, but I actually teare dup at that story. You're just a big softie! You'd better not look at the other 8 clips then! This is a very moving story. I have a little children book about it. Oh, what a touching story! Such Devotion! Dogs are Amazing beasts! I LOVE it! Of all animals, the human being is always the most stupid and cruel. Beautiful, as usual, your stories about Edinburgh. I remember this story. My father is from Edinburgh and he told us this story several times. When we went to Edinburgh he took us to see the statue and graveyard. It is a sweet story! There is something about dog and horse stories that ALWAYS gets to me. No matter what kind of day you may have had, dogs are always glad to see you and cuddle up. Did you know that there was a film made in 2009 entitled "Hachi" based on another dog in Japan in 1925, who also had this same intense loyalty after his master had deceased. He would visit the train station day and night for 9 years waiting for his master to come home. The real dogs name was "Hachiko" which means 'good fortune'. Dogs are our good fortune to love and care for. If only more people could be as loving and loyal as they.